Opening up my own tattered copy of Veganomicon on a Saturday night to make something special after a really rough day, I of course turn straight to the Seitan Piccata. I don’t need to read the recipe, it’s as much a natural function to me as walking and breathing. But I wanted to see exactly how it was written. 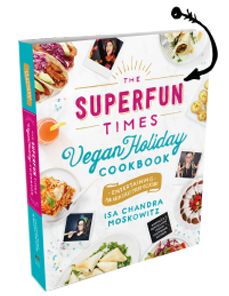 Because the thing is, when I created it for Veganomicon I…well, I wasn’t as experienced at writing recipes as I am now. That is to say: sometimes I look at the directions in older recipes and think “Holy hell, no way I’m doing all that!” As the years go on, I get, well not lazier, but let’s just say more efficient. Like any craft, recipe writing can take years to master. And so I present you with a revised Piccata. I’ve streamlined the directions a little, as well as the ingredients list, and this version is, I think, a little bit easier to accomplish on a weeknight. The changes I made were pretty basic: onions instead of shallots (since I always have them), upped the garlic (because, duh, more garlic always), upped the wine and added a little nooch for thickening. I also top with whatever fresh herbs I have on hand, and this time it was chives. And so here’s an updated version with all of the lemony capery goodness intact! I hope that you’ll love it as much as (if not more than) the original. ~ I love to use Homemade Seitan in this recipe. And you can streamline the seitan recipe, too. Leave out the garlic since there’s plenty of garlic in the piccata. And why not go ahead and leave out the lemon juice, too. It results in a firmer seitan that works perfectly here. ~ To get everything done in a decent amount of time, follow this schedule: 1) Make the seitan a day ahead, giving it plenty of time to cool. 2) Start the mashed potatoes before everything else. 3) Saute or steam greens in the last 10 minutes of your piccata reducing. By that point, your potatoes should be done and the stovetop should be at least a little less hectic. ~ For the broth in the piccata sauce, you can totally use a cup of leftover broth from the simmered seitan. Add one cup of water to get the two cups you need, since the seitan broth will be very strong. Preheat a large skillet, preferably cast iron, over medium-high heat. Dredge half the seitan slices in flour to coat. Add a thin layer of olive oil to the pan, and cook seitan until lightly browned, about two minutes on each side. Coat the other slices and repeat. Place the cooked seitan on a plate and cover with aluminum foil, to keep warm. Do not rinse out the skillet, as you’re going to make the sauce in it. If there is enough oil left in the seitan the go ahead and saute the onions in it. if not, add a little oil and saute them for about 5 minutes, until lightly browned. Add garlic and saute for a minute or so. Add the wine and raise the heat to bring to a rolling boil. Add the vegetable broth, salt, black pepper, and thyme. Let boil and reduce for about 7 minutes. Lower heat, add capers and lemon juice, plus the nutritional yeast to thicken a bit. Cook for another minute or so, to heat the capers through. 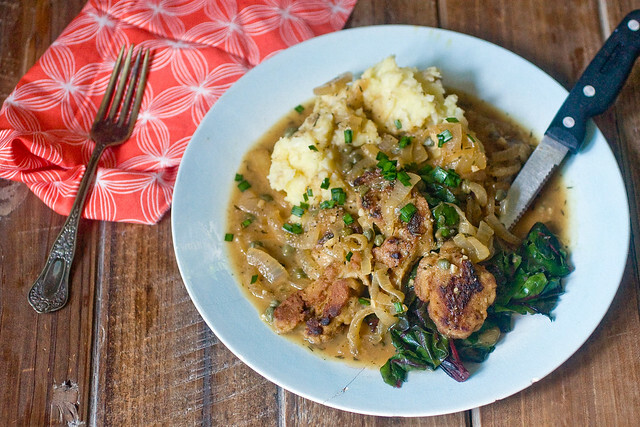 Serve over mashed potatoes and greens, with plenty of sauce on top. Garnish with chopped chives. This looks so yummy and comforting. I think this is a must for when I finish my cleanse (eeep, what am I doing?) Love the additional garlic and nooch. I just made this! Really! But I used Ray’s Seitan. Wowzers! That meal looks incredible. I’m going to have to try that Piccata sauce soon – it looks so warming and filling. And anything with mashed potatoes and sautéed greens is perfect with me! If you wrote “Veganomicon: Simplified for the lazier cook” I would happily own it along side my copy of Veganomicon. Is your seitan recipe in one of your books? I updated this to include the link. Thanks for catching that! I’m going to try this but to be perfectly honest I will use store-bought pre-made seitan from WF. If all goes well with the recipe, then I can use the boxed make-from-scratch seitan mix that’s been gathering dust in my pantry! I love that you revisited and streamlined the recipe. Sure! Just make sure to use one that can be cut into strips. I think WestSoy brand will work. Unless you’re in NYC or Philly, in which case Rays. I am in Philly – not familiar with Ray’s – I’ll be on the lookout for it – thanks! If I leave out the nooch will it stll turn out ok? Yep! Perhaps sprinkle in a few breadcrumbs just for thickening. Yes!!! I already love the Veganomicon version (my copy is tattered too) and look forward to this simplified recipe as well. Love it served alongside the Caulipots! I concur, I love Vcon but it can be daunting. I’d totally buy a simplified version. 🙂 Or a digital re-release simplified one. This is one I’ve never tried, looking forward to it! If I don’t want to use wine, do you have non-alcoholic replacement suggestions? Thanks! Sure, some extra veg broth and a splash of balsamic at the end. This was absolutely fabulous, the only thing I would do different is double the sauce recipe. My favorite italian dish used to be a chicken piccata from a favorite local restaurant, now I don’t have to miss it anymore. Had marbled banana bread for breakfast and seitan piccata for dinner Sunday, a gastronomically good day. You are welcome in my house anytime. I made this, and it was good! I used the Seitan Cutlet recipe that gets baked in the oven instead of simmered stove top (from your book.) I’m surprised at how tasty this stuff is! Me and my vegetarian friend made seitan for the first time tonight, as she found out that she’s allergic to soy and needs an alternative protein…and I’m a chef, so I like to cook everything and often. Thanks for the great recipe! I just made this dish and it was absolutely delicious – a real comfort food. I also made your home mad seitan which was the best I have had! Thanks so much! Love your recipes. This looks like a fun spin on an Italian favorite – yum! This is an absolutely amazing recipe and has been committed to memory thanks to your cookbooks. In this version, you use yellow onion vs. shallots. i’m curious why you changed… merely based upon what was on-hand? Or is this an improvement over the original recipe? Yes, just because I had onions and I assume most folks do, too. More so than shallots. This was most fantastically delicious. Served over sweet potato mash with a side of roasted Romanesco cauliflower, a beautiful and weird looking vegetable that showed up in this week’s CSA. And fir the cheap wine question, I find Trader Joes $3 wines great for cooking. Not sure what might make wine non-vegan though. Amazing recipe! This always comes out perfect. I have tried so many bad recipes for Seitan, Skye Michael-Chef (The Gentle Chef), that I only use PPK. So consistent! He claims ethical vegan, but do they really drive cars and pet caged dolphins? Seriously! Any idea of the nurtrional info (I’m doing my own version of Weight Watchers) by any chance? It sounds amazing and looks delicious! This is the meal that turned our friends into part-time-vegans. Hey! It’s an improvement! » Freaks and Geeks Lights! Camera! Vegan! This beats any meat dish, ever. This is sooo good, a keeper! Thanks Isa, scrumptious! Can you use chickpea flour for this recipe instead of all purpose flour? One of my favorite recipes! I add chickpeas just because why not? Wow! this is SO good. My friend, a non-vegan, just loved it. Have to do it again. Thank you! This is very good and I really enjoyed it. It comes together easily and I like that there’s so little chopping involved. This recipe will definitely be repeated. this is a new recipe I see here and if you want to sharpen your knives then you should use an electric knife sharpener visit his website.